It's fine because he's part of "the network’s lineup of opinion programming." Back in April, Fox News host Sean Hannity told NYT’s Jim Rutenberg, “I never claimed to be a journalist,” in response to criticism over the newsworthiness of his interviews with Trump. 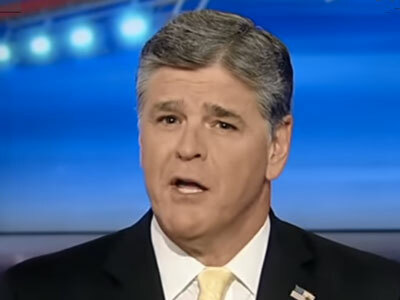 Hannity was just, as he said in a video, “a talk show host,” a creature altogether different from those in a profession whose job it is to collect facts, determine their accuracy and report the truth. Perhaps this is why, despite a memo sent Tuesday afternoon by Dana Blanton, Fox News vp of public opinion research, telling producers and politics staff that online opinion polls “do not meet [Fox News’] editorial standards,” Sean Hannity touted just those polls on his show Tuesday night. Perhaps because they were following standards similar to those Blanton outlined. That CNN poll Hannity mentioned was scientifically rigorous, unlike the “many, many” online polls Hannity used for his argument. A representative for Fox News noted both Hannity and Kilmeade are hosts in the network’s lineup of opinion programming. The representative also pointed out that Hannity has publicly disclosed that he has endorsed Trump.